September 24, 2006 – we were scheduled to meet at Andheri, SV Road, near Ahura Bakery as usual at 6 am. Team size anticipated around 32 to 33. 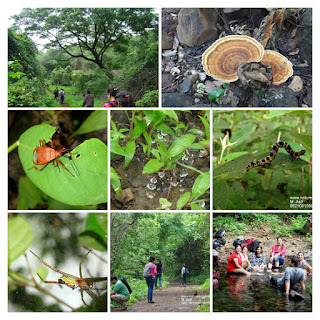 Team Nature Knights for Exploration Trek to Visapur Fort and Bhaja Caves was a mix of some old and new members. We started at around 6:30 am; picking-up members at Bandra, Sion, Chembur and finally last person after Mankrud bridge. After picking up the last person we immediately started a theme based introduction; the theme was to brag about oneself and what was their fantasy for a dream one-day trek. The imagination for fantasy was stretched from dream one day trek to a full fledge expedition at Amazon Forest to an ambition to explore entire world going to the extend of scuba diving and flying a fighter jet; this was coupled with a brief about oneself. As the introduction got over; we were almost at the express highway food mall. The breakfast was stretched from originally announced 15 min to 45 min; due to slow service at the restaurant. This at the cost of annoyance of few sincere members who strictly stuck to the agreed schedule landed up on time at the bus in 15 minutes. Killing time while waiting for other can be one of the most annoying times to pass. We reached base of the Visapur hill; at Bhaja Village exiting express highway Lonavala near Walvan Dam, then taking left around 15 km further down on National Highway NH4 at cross road junction with one road going to Karla Caves and other to Malavli Village where we were heading. A quick session on Dos and Don'ts; followed by a quicker script on Visapur / Lohgad background we started with our local boy-scout Vishal who was our route guide for rest of the day. Our first major destination for the day Visapur stands tall at a height of 3567 feet; this fort is located next to another fascinating fort Lohagad. These two forts are separated by a small khind called Gaimukh. These forts were built during the period of Satavahana reign. After being under the control of Nizamshah and Adilshah, the forts were then conquered by Shivaji, Later in a treaty signed by Shivaji with Mirza Raje Jaisingh, he handed over twenty three forts to Aurangzeb. Subsequently he recaptured these forts; after his death the forts came under the rule of Mughals before Kanoji Angre won it back. During the time of the Peshwas these forts were used quite a lot. The last rulers of the fort were British. Important factor to enjoy trekking day after day and year after year is all about understanding one self (understand your physiological and technical capabilities); understand the environment and terrain; co-op as a team and understand the agenda for the day and/or trip. And most important enjoy your trek and company. A trekking party; especially having 32 or more varying degrees of dynamics will have all kind of characters; There will he ones whose objective in life for a trek will be to reach the top as-fast-as possible; dig the flag post and then also start back ASAP. Then there will be other end of the contrast who will want to laze through the entire trek; for various reasons from being tiered due to lack of sleep and or fitness level at that time and date or simply don't want to rush through the things; nothing wrong with that but we also have a tentative time table to maintain. Most of the members (90%) will lie between the two extremes. And we will exclude the two extreme exceptions when we decide on ideal trekking etiquettes. Visapur can be approached by two routes; one route is to climb the trail leading to Khind between Lohgad and Visapur; follow the trail to your left leading towards Bhedse hill; along this route you will find a path which steeply climbs through a arête ending up into the fort, this is not regular entrance; we took another route which starts from the stairs leading to Bhaja Caves; after climbing few steps you then take diversion to your left where a small trail climbs above the Bhaja Caves hill to takes you to a small plateau. From this plateau you can see the fort very clearly. You maintain your progress keep to the left hand side of the hill as you climb up along the walls till you come across a small waterfall and then from here a small trail leads you the start of stairs leading to the entrance of fort which has a Maruti Temple just few steps short of the entrance. As we climbed our team was soon split into two as we huffed and puffed arrived over the first hump of the hill and let our bodies get acclimatize to the semi-hectic activity planned for the day. Acclimatization is very important; there I various rules; I as an individual like to take my first break after 20 minutes to 45 minutes depending of the gradient of slope to be ascended upon; this allow my body to get ready for the activity planned. Thereafter we take small breaks of 5 minutes after every 30 to 40 minutes of walk. The sun was smiling; breeze was having a swing with blooms of flowers all over the hill. There were colours everywhere yellow; blue; red; purple and shades of green below and on the top sky blue with fluffy whites. Soon the two teams assemble on top of the first hump; from here we could very clearly see the express highway on the northeastern side of the hump and exactly the opposite was the hill on which the majestic Visapur fort stood; most of the fort walls looked unapproachable from all angles; the entrance our guide told has was behind the face of rock and in the arête formed by between two extending arms of the hill; As we climbed we came across a trickle of water fall; some of the last few steps were slippery with a temple of Maruti just short of around 50 to 70 steps before the entrance. There were also few natural caves and a few small accommodation chambers carved in the rock face. The first group reached the top; we were waiting for the remaining members to catch-up. There was a large cannon placed in a static mode to welcome the enemies approaching the main gate of the fort; the structure of the fort was such that remaining around 50 soldiers guarding the fort entrance could also join in welcome party by contributing stones; hot oil; arrows; spears; etc etc. We found lot of water holes; tanks on the fort which seemed to be pretty large. Few buffaloes we enjoying their holiday in couple of such muddy water holes eyeing us suspiciously that we may disturb their territory and tranquility of holiday in a paradise which had plenty of green. After some debate we decided to shift our venue for lunch banquet from sun basked courtyard of Shiva temple to a small watchtower located to the South of Visapur fort. The lunch as usual was nothing short of lavish with lots of cultural mix from parathas; theplas; bread; wada; vegetables; biscuits; honey; curd; our royal baked beans in tomato sauce; idli (rice cake); sweet lime; I lost count of the variety; the most out-going personalities enjoyed the most of it and those who felt shy may have lost to make most of the party. Soon after lunch we decided to explore the other side of the fort; followed by a debate on which exit to take the original entrance or the more adventurous one climbing down from the arête on the west side of fort facing Pauna lake. From the west side of the fort we could very clearly see from from left to right starting from Bedse hill; Tikona Fort; Kathingad; Morvi Dongar, Jambuli and finally the majestic gates of Lohgad. The decision was made to explore the remaining fort and then descend from the original entrance, which is towards southeast side of the fort. The walls on the North east side of the fort are still intact and in good shape; we spotted the large chakkis(mills) where lime and jaggary was once upon a time mixed for cementing the wall of fort and also the one used for grounding grains to flour for the habitants. We explored few more structures which were well preserved before starting our descend back towards Bhaja Village. Few new comers found descending the hill a bit more difficult due to few slippery steps and rocks. We reached entrance of Bhaja Caves around 5:45 pm; it was time to shut the doors for visitors at Bhaja Caves; we managed to negotiate with the caretaker to let us explore the caves for few minutes. We found three chambers of this caves very interesting; the first one near the main entrance; the main chaitya having a single large prayer dome at the end will the pillars supported by wooden frames; then there was this chaitya having around 16 prayer domes (Stupas). We tried humming OM in different locations and styles to get the feel of positive vibrations at this place. There also one very interesting chamber towards the end which has carvings of a prince or king riding a Chariot of 4 horses and also one where he is riding an elephant. After cave exploration; we descended to the Bhaja Village for a round of fresh lime where we had our windup session; which is a feedback session. We had all kinds of suggestions; criticism for not being too tight on timetable; blessing; we could see the 32 degrees of dynamics playing. Overall the adventure was satisfactory except we were one hour behind schedule overall; but then I feel that is acceptable delay. The final phase was in the return journey; we sang all the ways back till Andheri till we bade each other Phir Milegee.